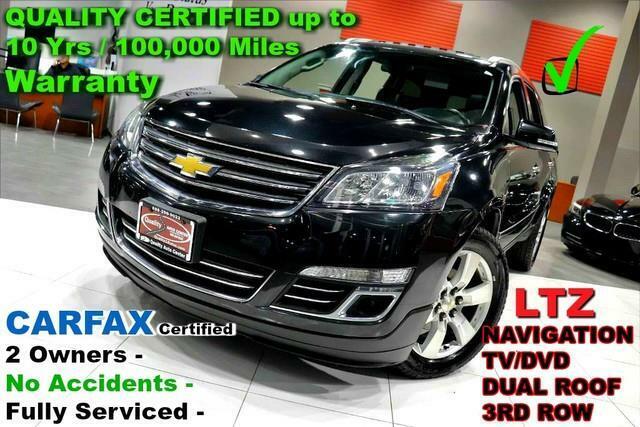 Quality Auto Center is pleased to be currently offering this 2013 Chevrolet Traverse LTZ - CARFAX Certified 2 Owners - No Accidents - Fully Serviced - QUALITY CERTIFIED up to 10 Yrs / 100,000 Miles Warranty with 83,271mi. This Chevrolet includes: ENTERTAINMENT SYSTEM, REAR SEAT DVD PLAYER WITH REMOTE CONTROL, OVERHEAD DISPLAY 2 Auxiliary Audio Input Entertainment System AUDIO SYSTEM FEATURE, BOSE 5.1 SURROUND SOUND 10-SPEAKER SYSTEM Premium Sound System TRANSMISSION, 6-SPEED AUTOMATIC A/T 6-Speed A/T ENGINE, 3.6L SIDI V6 V6 Cylinder Engine Gasoline Fuel LTZ PREFERRED EQUIPMENT GROUP SEATING, 7-PASSENGER 3rd Row Seat Rear Bucket Seats Pass-Through Rear Seat Bucket Seats BLACK GRANITE METALLIC COLOR TOUCH NAVIGATION SYSTEM Navigation System SUNROOF, DUAL SKYSCAPE 2-PANEL POWER Generic Sun/Moonroof Sun/Moonroof Dual Moonroof AUDIO SYSTEM, COLOR TOUCH NAVIGATION AM/FM/SIRIUSXM/HD RADIO WITH CD/DVD PLAYER HD Radio Navigation System CD Player AM/FM Stereo Satellite Radio Bluetooth Connection Auxiliary Audio Input MP3 Player *Note - For third party subscriptions or services, please contact the dealer for more information. * This is a Certified Pre-owned vehicle, so you can feel rest assured that it has been meticulously inspected from top to bottom. With this exceptional SUV, you'll get sport, utility, and comfort. Put performance, safety, beauty, sophistication and all the right amenities into a car, and here it is! Now you can own luxury without the luxury price tag! The incredibly low mileage and painstaking upkeep on this Chevrolet Traverse makes it a once-in-a-lifetime deal that won't last long! Call us today to reserve your test drive! If, upon choosing the road less traveled you find yourself lost, relax and remember this beautiful car has navigation. Marked by excellent quality and features with unmistakable refined leather interior that added value and class to the Chevrolet Traverse If you're in the market for an incredible Chevrolet featuring an Entertainment package that will surely keep your passengers enthralled, then you'll definitely want to check out the Chevrolet Traverse LTZ - CARFAX Certified 2 Owners - No Accidents - Fully Serviced - QUALITY CERTIFIED up to 10 Yrs / 100,000 Miles Warranty. More information about the 2013 Chevrolet Traverse: The Chevrolet Traverse starts at just over $31,000 and offers a lot of space and luxury for the price. Unlike the myriad of minivans available, the Traverse has bold SUV like styling without giving up too much interior volume. The interior space combines with a cushy ride, to make the Traverse a fairly pleasant place to spend time in. The vehicle strikes a very nice balance between these various attributes, making it a good value for families seeking comfortable transportation. Strengths of this model include Room for up to eight, attractive styling, car-like handling, upscale amenities, and available all-wheel-drive No Credit / Bad Credit / No Paystubs, No problem !! ! All Approved ! Everyone drives ! CLEAN, GORGEOUS, LOW MILES, SHOWROOM CONDITION. CALL NOW QUALITY CERTIFIED up to 10 YEARS 100,000 MILE WARRANTY , To Certify a vehicle, there will be an additional cost for Certification. CALL NOW For details. STUNNING AGGRESSIVE LOOK ON THIS BEAUTIFUL--Call today to schedule a test drive... Good Credit/Bad Credit/No problem!!!! Get paid cash? No problem!! 100% Credit Approval with interest rates starting at 2.49% for qualified customers, our rates will not be beaten. We price our cars at wholesale price to guarantee the best deals for our customers. Our inventory moves quick, please call to confirm the availability of the vehicle of your interest Springfield location 973-564-0112. This vehicle is located at our SPRINGFIELD location. Come visit our new showroom in Springfield NJ.